Travel through the square in Thurles, over the Suir bridge, past the Cathedral on the left. 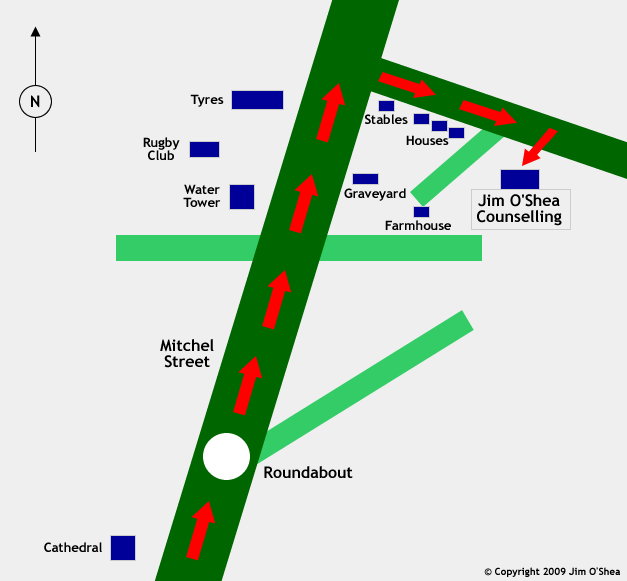 Enter the small roundabout a hundred metres from the Cathedral, and keep left up Mitchel Street. Drive through the first crossroads, past the water tower and the graveyard. you will soon see a large barn with the words ‘tyres’ written on it. Drive past the barn, and turn right at the junction twenty metres beyond it. You are now very close to my house. You will recognise it by the tall stone chimney and its location next to a small bridge. The Counselling room is the small building with its own private entrance next to the house. The journey from Thurles takes about 4 minutes.